An armed suspect was taken into custody late Friday, putting an end to an hours-long standoff inside a building in San Francisco's Mission District, police said. 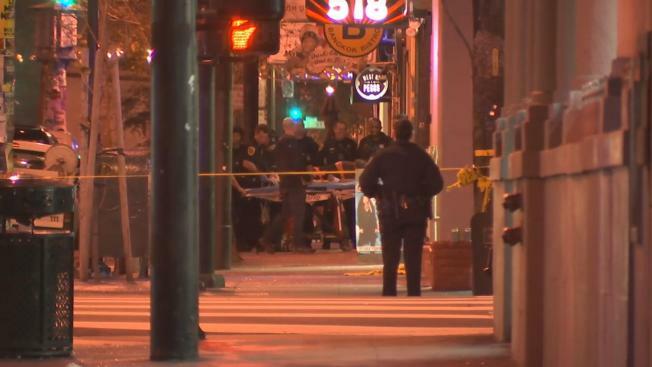 The suspect, identified so far only as a 60-year-old woman, "stepped into the hallway" at the Crown Hotel on Valencia Street around 9:05 p.m., Sgt. Michael Andraychak said in an email. She was taken to a hospital for evaluation. No charges have been filed at this time, police said. The incident began around 2 p.m. with a call about a person with a gun on the 500 block of Valencia Street, police said. Upon arriving on the scene, officers realized that the woman had shut herself into the apartment. The call came in after a pest control worker knocked on the suspect's apartment door. The woman opened the door and pulled out a gun and the exterminator fled, Andraychak said. Police said there were no reports of shots fired, but the entire block of Valencia Street was closed off while police negotiated with the suspect. A shelter-in-place order was in effect for residents and businesses in the area, police said. Police went door-to-door, telling people to remain inside their homes. "He said the block is on lockdown and you need to shelter in place," said witness Rebecca Pierce, who, along with a friend, was trapped in a restaurant for roughly 20 minutes before being evacuated. Pierce said she didn't feel safe when she and her friend were forced to leave the eatery without police protection. "The scariest part for me was having to run from the restaurant with cover," she admitted. "I thought I'd better run very fast." One man said snipers came knocking at his door, directly across the street from the woman's apartment. "They needed to use my room because it was perfect for them to control the situation," James Abel said. Abel noticed more SWAT team members as officers escorted him out of the building. "On each level of the Crown Hotel, there was an officer with tactical gear on," he said. It took nearly three hours for the suspect to even respond to negotiators, police said. After the woman surrendered, police briefly kept their perimeter and evacuation order in place while investigators checked the apartment for weapons or other potentially hazardous items. The San Francisco Police Department had rolled out numerous tactical units, including a bomb squad, but a department spokesman said that is standard protocol. There was no indication that the suspect had any explosive devices on hand. People were allowed back into the normally busy stretch of Valencia Street just before 10 p.m. The closure of the busy thoroughfare caused gridlock in the area. San Francisco Municipal railway buses were also being rerouted.